AVAILABLE - Just 35 min from EDMONTON CITY LIMITS, 2.03 acres, slightly rolling land, gas & power to property line. NEW BUILD only - manufactured or modular are totally discretionary uses (check the COUNTRY RESIDENTIAL LAND USE GUIDELINES. Dwellings must have a concrete foundation, min house size 1200 sq ft, garages are mandatory & can be up to 30'x28' & are to be built in association with the new residence. Before you build call LAC ST ANNE COUNTY & check the County Residential Land Use Guidelines. 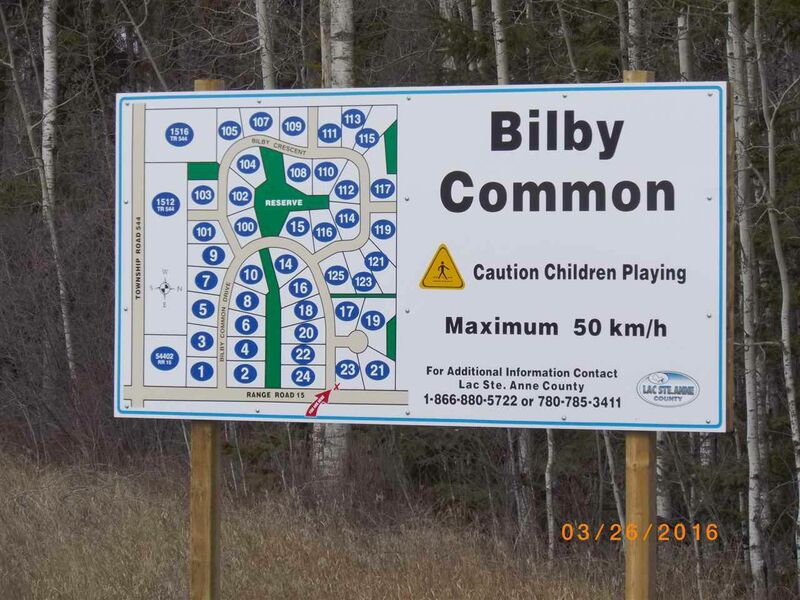 BILBY NATURAL AREA is just 1 mi north, DEVILS LAKE is 10 min north, ONOWAY is 8 km NW, ONOWAY to ALBERTA BEACH 15 MIN. TAKE A LOOK SOON - BUY NOW, BUILD LATER. Make your move now. On the subdivision map this is lot 112, LEGAL DESCRIPTION is Lot 4, Bl 2, Pl 1123418.